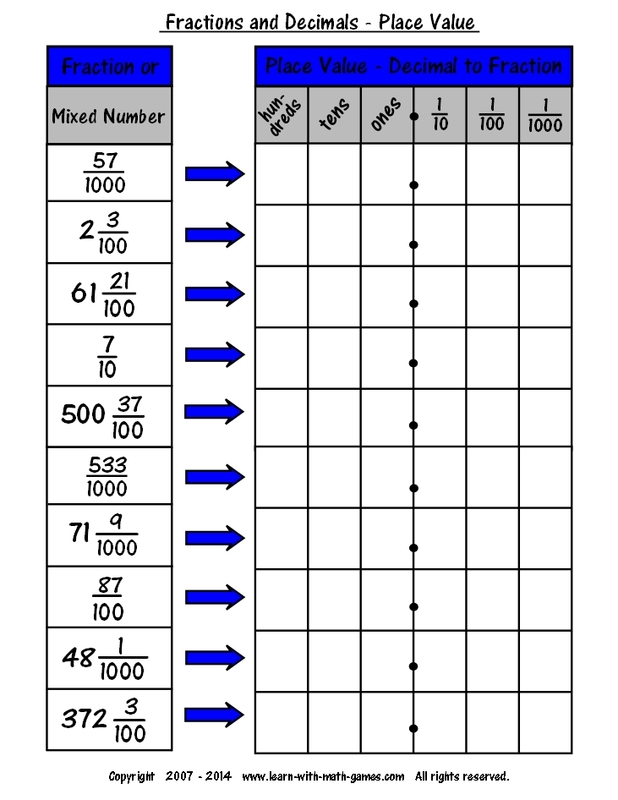 So how about a nice handy fraction to decimal chart to spice up your lessons on decimals and fractions! Got it for you here. 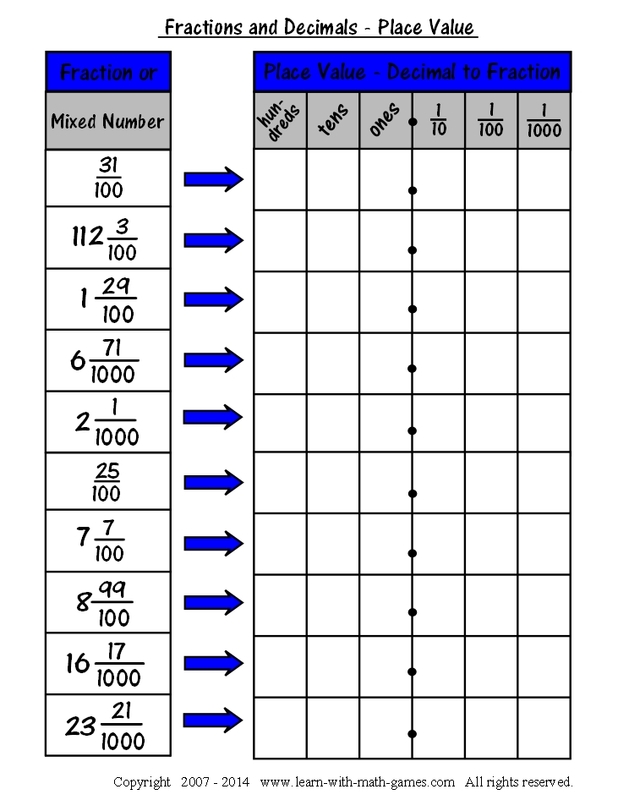 Also be sure to check out the printable fraction to decimal worksheets further down the page. Students need to know how decimal numbers and fractions are related. 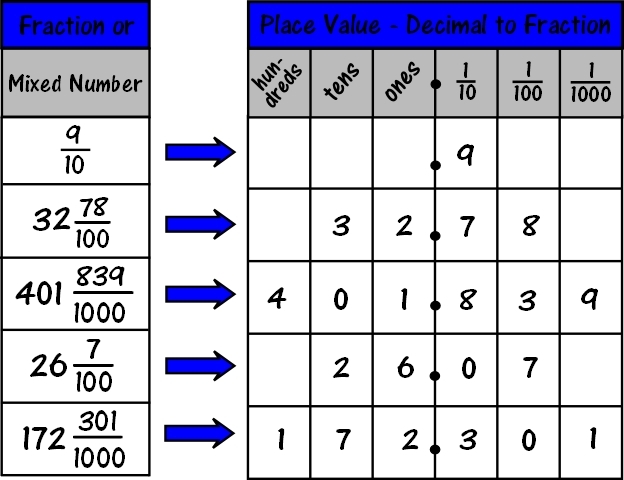 The fraction to decimal chart gives students a good idea of how the place values to the right of the decimal point can be represented by the fractions one-tenth (1/10), one-hundredth (1/100), and one-thousandth (1/1000) respectively. You can print a copy of the chart above so your students can use it as a reference. It also explains step-by-step how to change a mixed number to a decimal. Write the whole number to the left of the decimal point. of places we will have to the right of the decimal. Write the numerator to the right of the decimal point. Fill in a zero to the left of this number if needed. They should be comfortable converting fractions to decimals and visa-versa. They need to combine their knowledge of place value, whole numbers, and fractions, in order to have a thorough understanding of how decimals fit into the picture. We've provided some fraction to decimal worksheets below for your students to get some practice. You'll find the solution sheet as well. Another good teaching tip for helping students master this area is getting them familiar with some of the more recognizable fraction - decimal equivalents. For example, one-half is the same as .5. Another example is one-fourth in decimal form is .25. A creative decimal activity - students learn about decimal, fraction, and percent equivalents. Students get practice adding decimals together to make 10. Reading and writing decimal numbers is a must for elementary and middle schoolers.